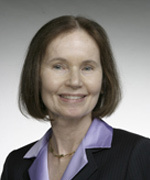 Dr. Carol Caton is a Professor of Sociomedical Sciences in Psychiatry at Columbia University Medical Center. Dr. Caton is currently principal investigator of three NIDA-funded longitudinal prospective studies. She has published extensively on outcomes of schizophrenia, homelessness and several mental illness and substance use comorbidity. Her new book, "The Open Door: Homelessness and Severe Mental Illness in the Era of Community Treatment," explains how and why homelessness among the mentally ill has persisted over the past 35 years, despite policy and program initiatives to end it. The book reviews critical issues in managing severe mental illness in the community setting, and presents evidence of the effectiveness of service and housing interevntions that have brought stability to the lives of many. In her Lunch & Learn talk, Dr. Caton discussed different types of supportive housing and why they are viable options to prevent homelessness. Finals got you stressed? DeStress Monday can provide you with simple techniques to wind down and reset before another busy week! 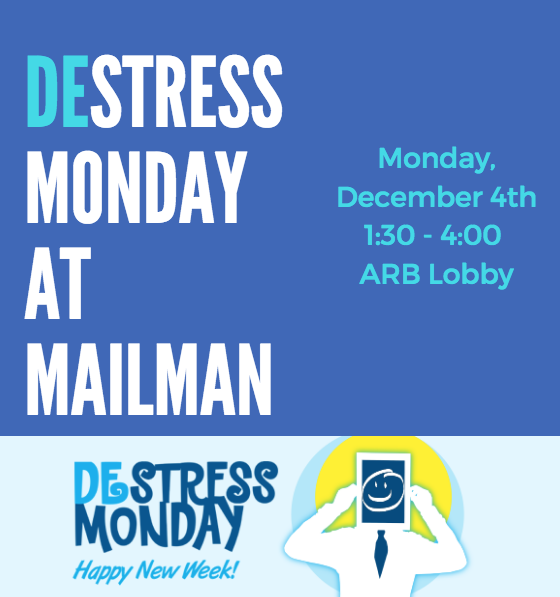 Learn more about DeStress Monday, here. Facing increased marketing restrictions, the tobacco industry dedicates nearly all of its promotional budget to product advertising at the point-of-scale. Cigarette companies have long targeted low-income and minority communities with aggressive promotions and advertisements, but it is less understood how Big Tobacco is shifting its strategy in today's diverse product landscape. How are products like cigarillos, blunt wraps, hookah, and vaping devices promoted differently across neighborhoods, and what is the potential impact on health disparities? This presentation will highlight results from a photo-documentation project that captured tobacco advertising in nearly 1,000 retailers across all 5 boroughs in NYC. Dr. Giovenco is an Assistant Professor of Sociomedical Sciences at the Mailman School of Public Health and a member of the Lerner Center for Public Health Promotion. He has published over 20 scientific articles on tobacco use disparities, was invited as an expert speaker at the National Academy of Medicine, is an Associate Editor for the journal Tobacco Regulatory Science, and is a recipient of the NIH Director's Early Independence Award. When it comes to eradicating health disparities, how we communicate matters. From critical conversations on the role of structural racism in health outcomes, to understanding the cultural nuances of language in various communities, the way we talk about health impacts outcomes. Leveraging decades of experience as a journalist and communication strategist and eight years of on-the-ground work in the Southeast, Philadelphia and Detroit directing maternal and child health-related programs and conducting community-partnered participatory research, Kimberly Seals Allers brings her lessons learned to this presentation on creating a blueprint for more impactful health promotion. 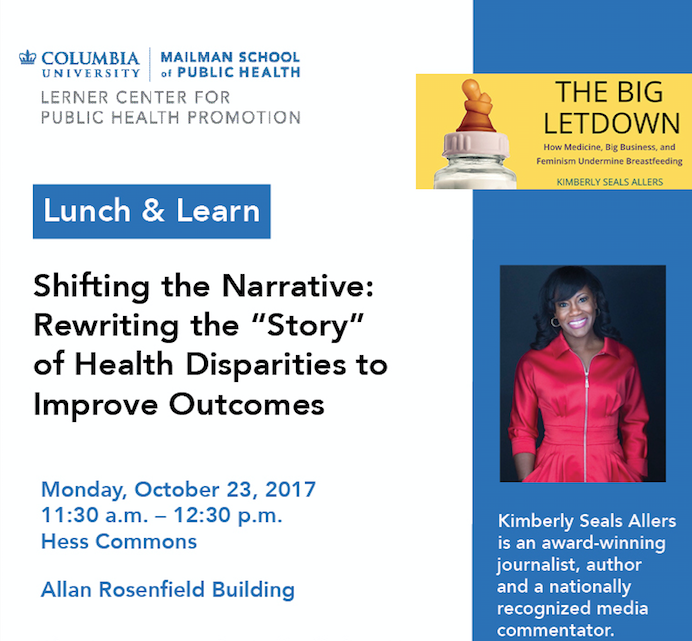 Kimberly Seals Allers, an alumna of the Columbia Graduate School of Journalism, is an award-winning journalist, author and a nationally recognized media commentator. A former senior editor at ESSENCE and writer at FORTUNE magazine, Kimberly is widely considered a leading voice in the countercultural social movement in infant feeding and the social, structural, and racial complexities of material and child health issues. 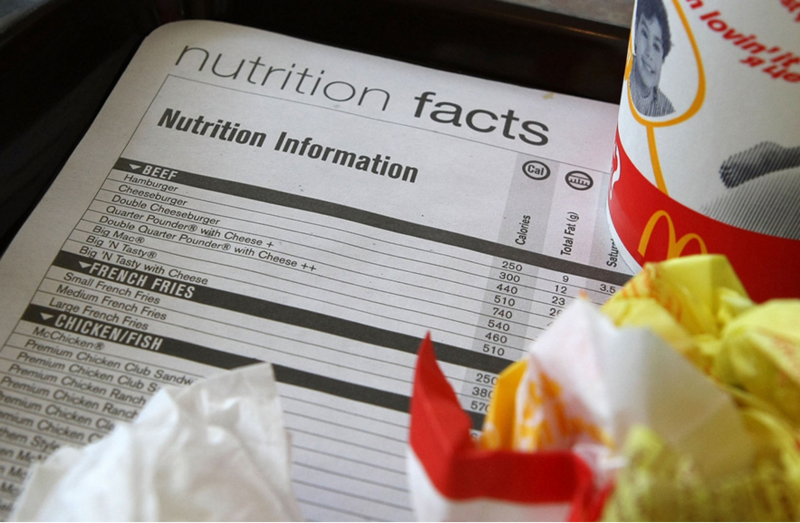 Skipping meat one day a week is good for you and even better for the planet. 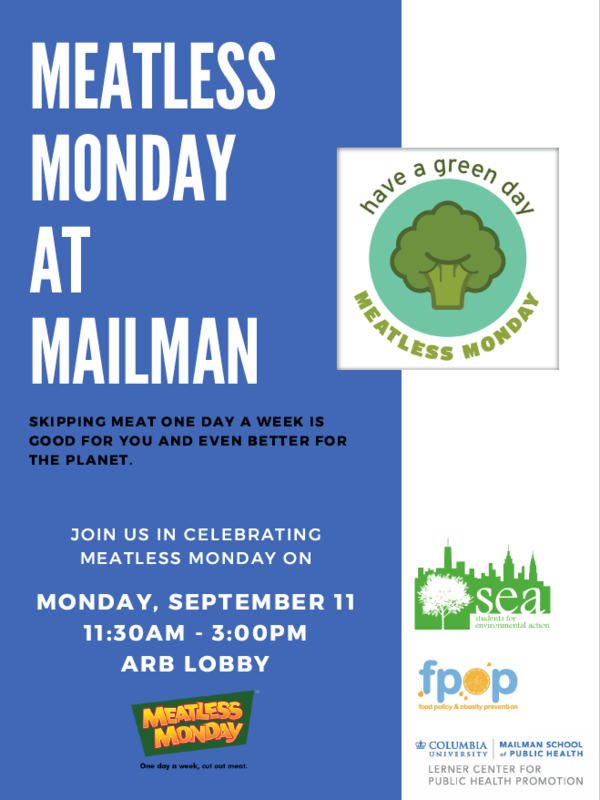 Join us in celebrating Meatless Monday at Mailman! There will be giveaways, healthy tastings and fun facts about the meatless movement! Click here to learn more about Meatless Monday! 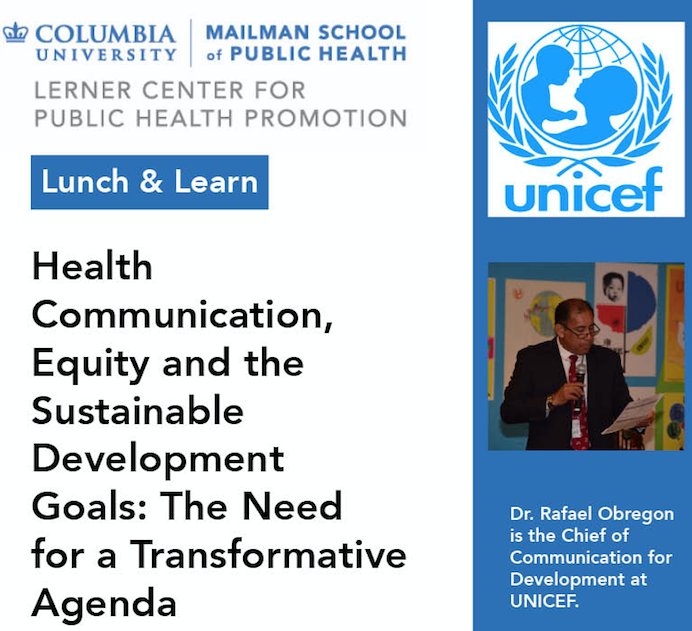 In his lecture, “Health Communication, Equity and the Sustainable Development Goals,” Dr. Rafael Obregon discussed the innovative health communication strategies utilized around the world by UNICEF. Rafael Obregon is the Chief of the Communication for Development Section, Programme Division, United Nations Children’s Fund, New York. Prior to joining UNICEF, he was an Associate Professor in the School of Media Arts & Studies, and Director of the Communication and Development Studies Program, Center for International Studies, at Ohio University; Associate Professor at the Department of Social Communication at Colombia's Universidad del Norte (where he is an adjunct faculty member), and Regional Communication Advisor for Maternal and Child Health, Pan American/World Health Organization. He has an extensive teaching, research and professional experience in development and health communication, and international development. He has served in several technical advisory groups, most recently to the IHR Emergency Committee regarding the Zika virus outbreak. How to Make a Public Health Documentary: HBO's "Risky Drinking"
Nearly 70% of American adults drink and nearly 1/3 of them engage in problem drinking at some point in their lives. 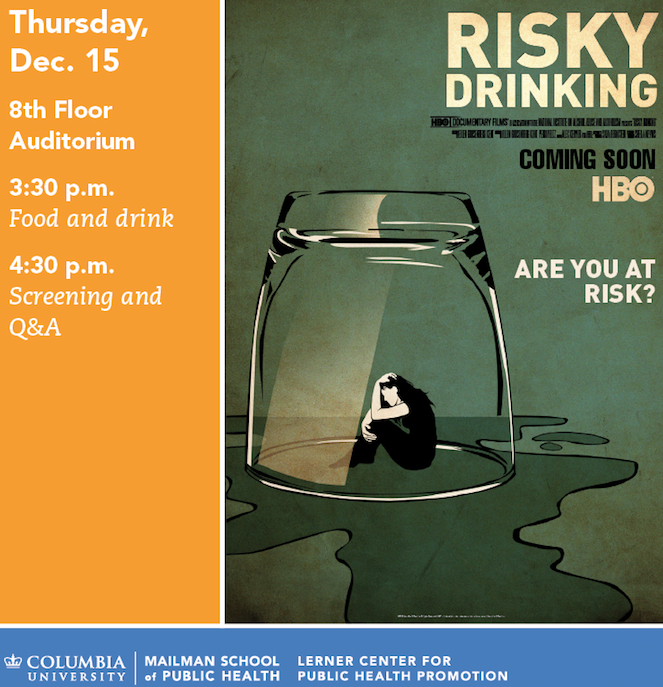 Produced by HBO Documentary Films in association with the National Institute of Alcohol Abuse and Alcoholism (NIAAA), "Risky Drinking" is no-holds-barred look at a national epidemic through the intimate stories of four people whose drinking dramatically affects their relationships. Through immersive storytelling, expert commentary and animation, this 85-minute film offers a new perspective on alcohol use disorder, as it falls along a broad spectrum of risk and includes life-saving information about what can work. The film aims to provoke a much needed conversation about how to identify risky drinking and to suggest alternatives to the one-size-fits-all treatment approach that prevents many people from seeking help. After the film, Perri Peltz (MPH '84) led a lively discussion about the ethical responsibilities of a documentary filmmaker. She commented upon the perils of addiction, the subject screening process, and her own ethical approaches to morally ambiguous boundaries. In his lecture, “A Health Policy Agenda Beyond the ACA,” Dr. Drew Altman spoke of the partisan divide within healthcare reform and conflicting health policy priorities by policymakers and politicians, the media and the American people. 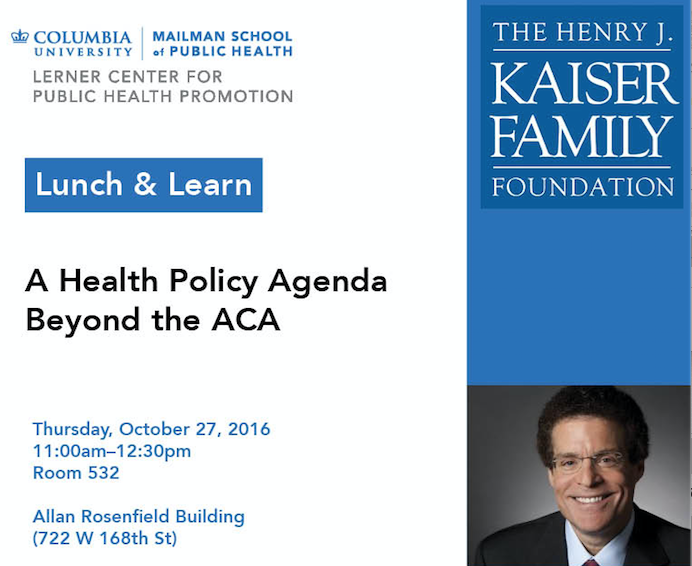 As an expert on health communication, he also discussed the media and its inaccurate portrayals of the ACA. Dr. Altman is President and CEO of the Henry J. Kaiser Family Foundation. The Kaiser Family Foundation serves as an independent and non-partisan source of research, analysis and journalism for policymakers, the media and the general public. Dr. Altman is an innovator in the world of foundations and a leading expert on national health policy. 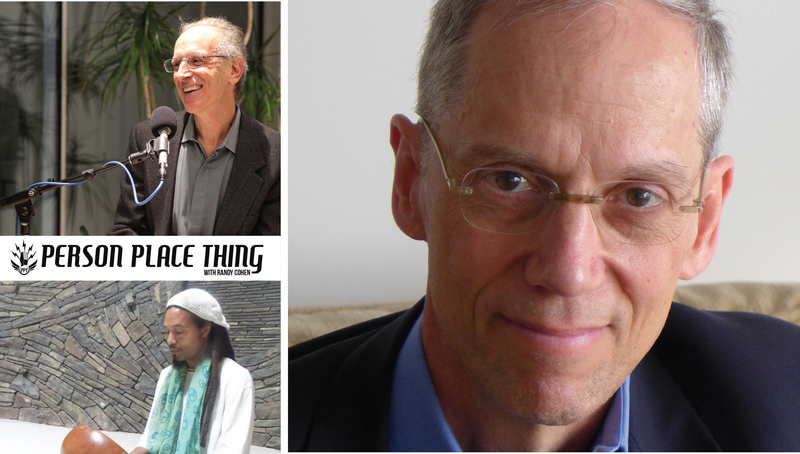 In this live recording of episode of Person, Place, Thing (the public radio show), Emmy Award-winner Randy Cohen will ask former NYC Health Commissioner Dr. Tom Farley about a person, a place, and a thing that are meaningful to him. This live show featured accompanying live music with Kevin Nathaniel Hylton. Tom Farley, MD, MPH, is the CEO of the Public Good Projects, a media effort to improve the health of the nation. From 2009 to 2014 he was the Health Commissioner for New York City. In those years, he advocated for innovative public health policies in New York City, including making the city’s parks and beaches smoke-free, raising the legal sales age of tobacco to 21, and restricting the burning of air-polluting fuels to heat buildings. James Colgrove and Rachel Shelton, both professors in Sociomedical Sciences, discussed the preliminary results of a content analysis conducted under the purview of the Lerner Center for Public Health Promotion, examining public comments submitted to the U.S. Food and Drug Administration in response to proposed menu labeling regulation. In their close read of 64 comments from industry groups and 33 from public health groups, Colgrove and Shelton identified two divergent ways of framing the debate: public health used the language of social justice, prioritizing collective responsibility and cooperation, while industry emphasized the values of market justice, placing a premium on individual liberty and economic opportunity. At-risk teens often use risk behaviors to stand out. In turn, they need custom-targeted, culturally appropriate messages and strategies that appeal to their identities and values. This workshop will review how you can truly understand your audience’s identities and share innovative strategies to evaluate your program reach. 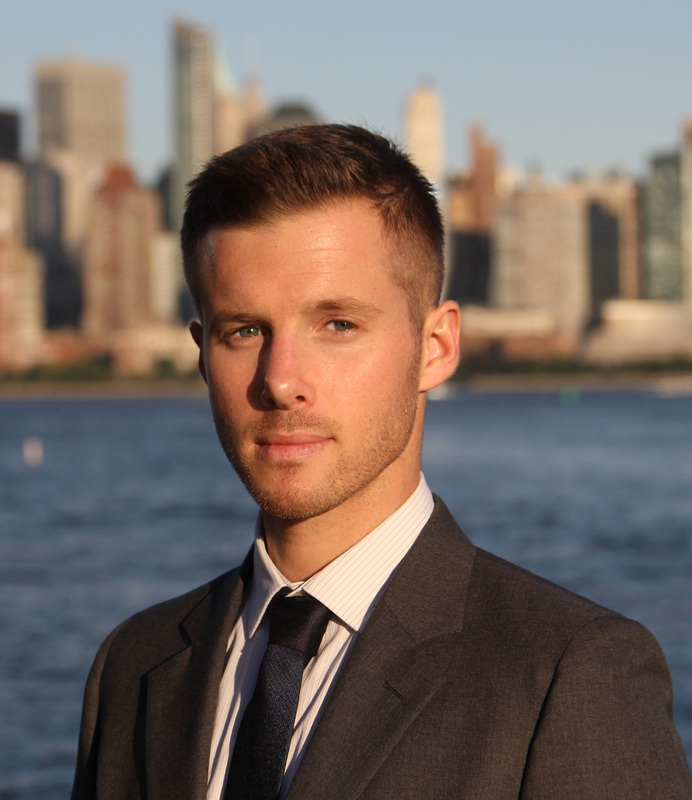 Tyler Janzen, Senior Director of Client Services, leads the Social Branding team at Rescue Social Change Group. Tyler will discuss interventions designed to reach teens at the local, state and national level. This presentation will explore how messages are tailored to the unique values of each crowd, and how digital and social media can be targeted to their unique interests. Peer influence is one of the most influential factors in teen risk behaviors. However, peer influence is rarely included in behavior change programs because can be an allusive variable to depend on. The concept of “peer crowds,” organizes American teens into five “crowds” that share similar interests, lifestyles, influencers, and habits. Each peer crowd has a unique set of values that can be used to create more effective messages and intervention strategies to influence risk behaviors. Everyday, millions of people search online for health information to answer questions such as: Should I give my daughter antibiotics for her runny nose? Could my headache be a brain tumor? When should I get my first colonoscopy? Like it or not, many people use a quick Internet search to seek health information, and Wikipedia entries are frequently the first results. This Wikipedia tour explores how the public uses Wikipedia to retrieve health information and guide their healthcare decisions. Students, professionals and academics in all health-based fields can contribute to to make sure these Wikipedia entries are accurate and understandable. Lane Rasberry is the Wikipedian-in-Residence at Consumer Reports. As someone who shares Consumer Reports’ mission of empowering consumers to become better informed about decisions they make, Rasberry edits Wikipedia health content to ensure that it is current, accurate, and science-based. * Correction Notice: The HIV/AIDS article has the paper printed equivalent of 400 pages of discussion and edits on issues like the credibility of sources, not 1,500 pages. Related articles including the one on the HIV virus present additional lengthy critiques on overlapping topics.